Yeah, so... I haven't been posting much lately. Partly because for a week I've been out of the Internet loop courtesy of Arvon's beautiful, and Internet-free, writing house. I had a great time learning (by doing) about writing musicals. The tutors and participants were brilliant, the food superb, the scenery lovely, and all in all the hardest thing about the course was coming back to reality afterwards. I know I'm not doing justice to the whole Arvon experience, but believe me, the only real way to understand it is to experience it. If, like me, your some of your favourite things in life are writing and meeting cool people, there's really nowhere better. Go on, try it... you know you want to. 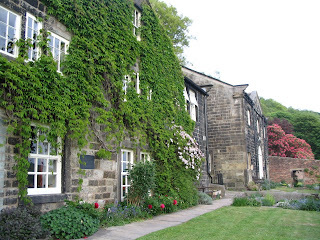 The picture below is Lumb Bank centre, once owned by Ted Hughes. I'm told the other centres are equally lovely.